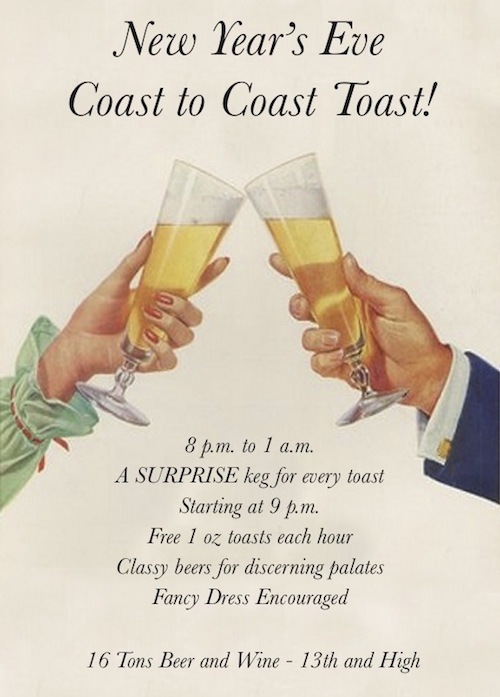 16 Tons New Year’s Eve Coast to Coast Toast! 16 Tons’ New Years Party celebrates Midnight in the four American time zones with flair and panache. 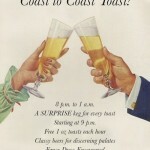 On Sunday, December 31st, 16 Tons at 13th & High will host their first New Years Eve bash: A Coast to Coast Toast! The Coast to Coast toast will feature some of the best that each American time zone has to offer in terms of craft beers. Starting at 8 p.m., we will be dimming the lights, lighting the candles, and generally enjoying each other’s company in the presence of 18 delicious beers on tap (with more than a few barrel aged beers and Hazy IPAs). At 9 p.m., Midnight in New York City, a surprise East Coast keg will be tapped. At 10 p.m., the East Coast keg will be swapped for a surprise Central time zone keg. At 11 p.m., we will toast with a surprise Mountain time zone keg and finally, at midnight, a secret Pacific time zone keg will be put on to celebrate the arrival of 2018 in Eugene. Guests will enjoy FREE ONE OUNCE TASTERS of each of the surprise beers with the choice to purchase a glass or pint for that hour thereafter. The party will stay classy until 1 a.m. Fancy dress is encouraged but not mandatory.